Landscape trees will make any garden look special. Their size creates a sense of scale while special features, such as flowers, make them very striking. I love landscape trees. They are so majestic, and there are so many different types of trees to choose from. Each have their own special places in a design. You might select a tree for its colorful flowers. Maybe you love weeping trees. Perhaps the tree has beautiful leaves. And then, of course, there are those that provide spectacular fall color. Trees are also lovely lit up at night. There are 3 main categories of trees. Here you will discover some of their attributes and also specific ways to use them in the landscape. I consider ornamental trees to either be flowering trees or to have some other special feature, such as interesting bark. In addition, these trees are usually smaller than shade trees. There are so many wonderful uses for ornamental trees. These landscape trees can be used at house corners or near the front door. It's very welcoming to approach the front door and walk near a beautiful tree. Ornamental trees can be used as driveway entry trees or as an allee along the driveway. They form a "frame" to go through. 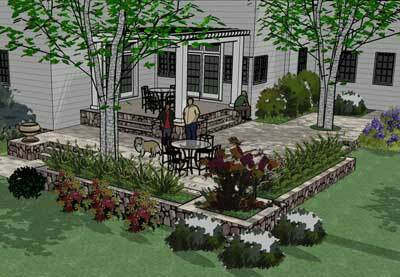 When creating plantings for privacy, they can be used in front of evergreen trees as a focal point. 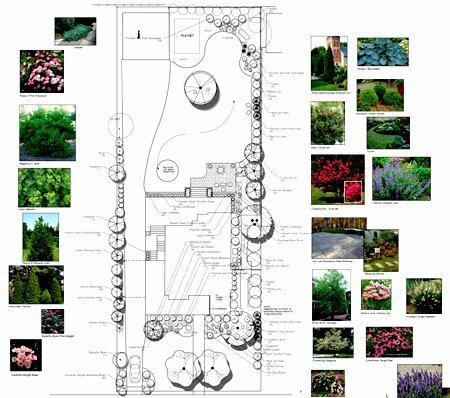 Multi-stemmed ornamental trees can be used for privacy themselves. These trees have numerous stems or trunks emerging from the ground, rather than a single trunk. 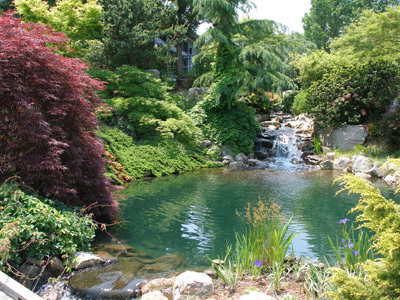 Ornamental trees are lovely near a patio or close to a water feature. Birch trees always seem to belong near water and look great there. Birch trees can also be set right in a patio as shown in the landscape photo (done in Sketchup) below. White Birch trees are set into this patio design. 'Whitespire' is a recommended variety as it is known to be disease resistant. (White Birch is susceptible to borers). River Birch are beautiful also with tan and rust colored peeling bark. 'Heritage' is a great variety. 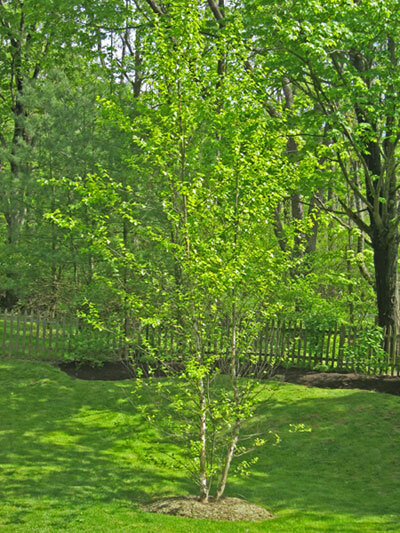 For more detailed information on Birch Trees see this article by Bartlett Tree Company. Birch Trees are actually one of my favorite to use in a landscape design. They have lovely foliage that is not too dense. All of them have beautiful bark, but I would recommend the Heritage Birch which is a variety of River Birch. River Birch Tree - Read more about the River Birch! Star Magnolia - If you are looking for a small ornamental tree, see the Star Magnolia tree, particularly Magnolia 'Jane' with its lovely pink flowers. Japanese Red Maple Tree - This is another small tree and has absolutely beautiful foliage. The 'Bloodgood' Japanese Maple has striking red leaves all season long. Flowering Plum Tree - With its reddish-purple foliage that lasts all season long, and pretty pink flowers, this is a great choice if you are looking for a small tree. Weeping Cherry Tree - This is one of those landscape trees that is a true focal point in the landscape, even when it is not showing off it's lovely pink cascading flowers in the spring. Its weeping form is both graceful and striking. The flowers are, however, amazing! Dogwood Trees - Lovely native trees that have some of the prettiest pink or white flowers. This tree also produces berries which attracts birds. It's a great tree with features in all seasons. Pink Flowering Landscape Trees - Here is a list of trees offering pink flowers. They stay green all year, as their name implies. When winter arrives, it's nice to have them in the landscape. And snow on the branches creates a lovely scene. Some even produce berries, such as the American Holly tree (one of my favorites). It will grow in sun or shade too. They can be used as screening along a property border to block a view or create privacy. When using this type of landscape trees for screening, those that have a wide, pyramidal shape can be placed in a straight line or staggered. More narrow trees look better in a straight line. You can actually plant evergreen trees much closer than their mature size would allow for; as they grow, they will fit the space. There are a few fast growing trees that I would recommend. I often space Norway Spruce 10' to 15' apart and Arborvitae just a few feet apart depending on the variety. They form one of the best backgrounds for other plants, causing flowers, textures, berries and leaves of ornamental trees and shrubs to stand out. Picture a mass of Red Twig Dogwood, with their winter time red stems, in front of the dark green trees. An evergreen tree can be used at the corner of a house for framing and strength. Cryptomeria or Nellie Stevens Holly are nice choices as they are narrower than many others...especially Nellie Stevens. 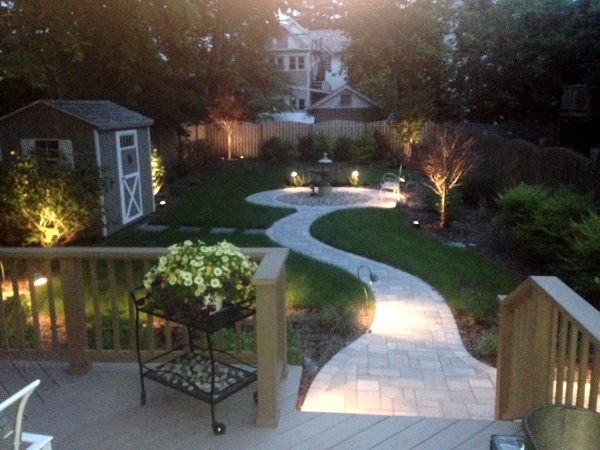 Evergreen trees can also be placed in the landscape as a focal point. The location might be in the backyard towards a rear corner. American Holly, with its red berries, is one that I like to use in my designs. The National 9/11 Memorial used only three different types of plants. The beautiful shade tree Swamp White Oak (416 of them were used), grass and Ivy. This is quite notable since the area encompasses eight acres. It also shows how simplicity can be striking. Is there anything as beautiful as a stately shade tree? (I know, there was a poem about that!) Here are some ways to use them and tips on placement. Shade trees are wonderful near a patio, terrace, deck, pool or anywhere to provide relief from the sun. They also produce an interesting contrast between light and dark in the garden. They can be used as an allee of trees along the sides of a driveway. Red Maples or Chanticleer Pears are great landscape trees for this look. Go here to get my free ebook!